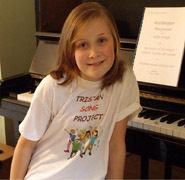 The Song Project was a musical collaboration between students at St Mary's School, Tristan, who wrote song lyrics about Tristan, and a music school in Norfolk, English whose students wrote the tunes. Songs written by pupils of St Mary's School have been set to music by the Norfolk Music School and are available as a song book. to the island where they are on sale to personal customers with any proceeds going direct to St Mary's School. 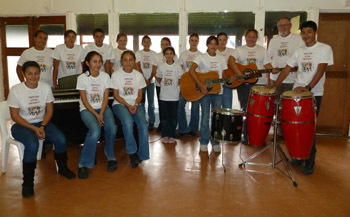 The band is called The Pop Up Guitar ensemble and is made up of Southampton-based music teachers and instrumentalists. We were joined by soprano Bobby Noyce who sang some items from Tony's Songbook - see photo above left. Bobby has seen Tristan as a child while returning to UK from Africa! With special thanks to local islander Frank Rogers who set the ball rolling! The concert went very well and nearly £500 was raised. £250 has been sent to Tony Triggs as Tristan Song Project Jigsaws and Calendars were sold and any profits will go towards funding an extended Tristan Song Project Book which is in preparation. £250 has been sent direct to St Mary's School on Tristan da Cunha for teachers to use to further music education as they think fit. We will report on what has been purchased when this is known. On 27 th March, Jim Kerr judged the Song Project competition, awarding first prize to 11-year-old Jasmine Sayer of North Walsham and second prize to Kirsty Woods of Southampton, also 11. To see and hear Jasmine’s melody with accompaniment by Tony Triggs go on www.NorfolkMusicSchool.com/young_composers_competition. Congratulations to the young composers and also to lyricist Kimberley Green of Tristan. The original setting of Kimberley's words by Tony Triggs has become a signature tune for the Project. Thanks to the competition, this could soon be replaced with prize-winning music by Kimberley's contemporaries, thereby linking child with child across the oceans – always the Project’s central aim. 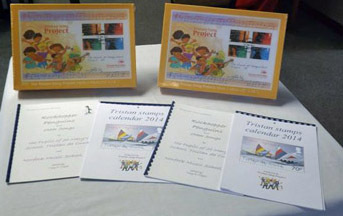 The Tristan Song Project is described in Pobjoy’s press release as ‘a model for similar projects worldwide and further information may be found at www. NorfolkMusicSchool.com’ which we are pleased to copy and endorse. island or supplied by the Project, along with words from some of the Project songs and jauntily-presented music notation. The 35p (recorder) stamp quotes the nonsense song “When Fish Get the Flu”. The 45p (violin) stamp has words from “Rockhopper Penguins,” reflecting the waddling antics of these much-loved island inhabitants. The 70p (guitar) stamp features “The Volcano’s Black,” whose menacing words match the smouldering menace of Tristan’s volcano. The £1.10p (accordion) stamp contains words from “The Molly”, a bird whose cry haunts the island’s gaunt cliff s.
The Song Project has had an exciting six months. In the UK, the annual Project garden party saw Project songs receive their first professional performance, given by Charlotte Joyce. 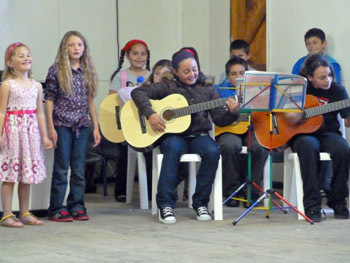 Her programme included settings of poems by Janine, Caryn, Rachel, Linda, Dean, Conchita, Natalie, Lynette and Riaan. 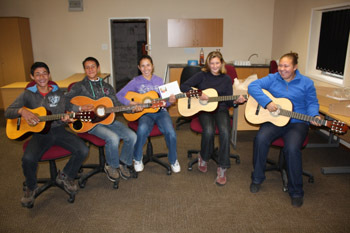 In October 2012 UK supporters were delighted when St Mary’s guitarists showed off their newfound talent to passengers from the Agulhas II. Two years ago, those guitars were in England, being packaged for the hazardous journey to Tristan. Since their arrival, Jim has helped the children to make the most of this gift, and the Agulhas evening showed the Project in action. Hopefully the Song Project will continue to be fostered in St Mary’s School after Jim Kerr’s departure. 2013 should see an island edition of the songbook, and a BBC broadcast as well as the February stamp issue. The Project still has its songbooks, mugs and tee-shirts for sale, and now there’s a Project jigsaw puzzle! 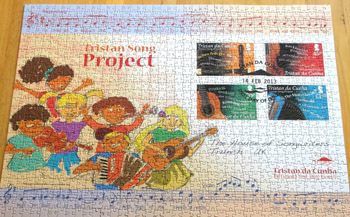 The 1000-piece jigsaw puzzle measuring 48 X 69 cm has just gone into production to boost Tristan Song Project funds. 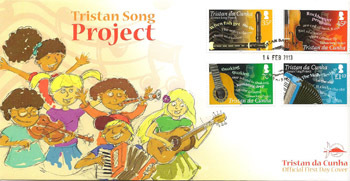 It shows the Song Project stamps on their first day cover – a lively design with cheery cartoon children playing assorted musical instruments. receiving regular lessons. The more advanced guitar group have learned the chords to accompany a ‘Volcano’ song with words from Rachel Green and music by Tony Triggs. when singing to the community or visitors. The Tristan Song Project continues to take its inspiration from poems by St Mary’s pupils which my (mainly) young composers in England turn into songs. Among recent songs are The Moody Sea with words by Dean, Natalie and Kimmy, and The Sea at Night, with words by Caryn. I’ve featured three or four of the songs in a Tristan Song Project lecture-recital and Jim sometimes leads performances to cruise ship passengers visiting Tristan. 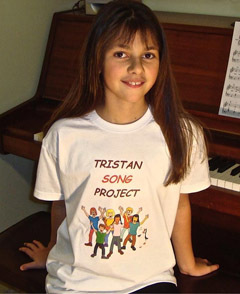 With this in mind, the Project is giving all the young Tristan poet/performers Song Project T shirts. With luck, they will have reached the island before or with this Newsletter. The five guitars sent earlier took up to seven months, so one never knows! ‘A Grateful Beak’ in appropriate costume! £7.50, and at the moment I have a dozen copies of a special ‘Penguin Rescue’ edition. This contains an extra song From a Grateful Beak, in which a penguin thanks the people of Tristan for saving it from the Oliva’s oil. The Project will take a big step forwards when an island edition of the songbook appears – something Jim and Dawn are planning. It will also get a major boost when the island issues a set of Song Project stamps in 2012/13. May Tristan da Cunha once again be what it was up to 1961 – an island of song! ~ or from Miles Apart. 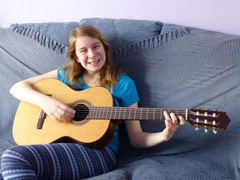 When the Edinburgh arrived in early June we were delighted to receive five guitars sent from the UK and funded by sales of ‘Rockhopper Penguins and Other Songs’, a book produced in association with the Norfolk Music School. Enthusiasm for learning to play the guitar is high and when I asked classes 2 to 5 who would like to have lessons, seventeen students showed an interest! I intend to start lessons in the near future and will initially cater for 10 students each sharing one of the new guitars. The book contains 14 songs – 13 with words by Tristan children and one called ‘Ratting Day’ with words from Jim Kerr. It is in A4 format and comb bound so that it opens flat. The songs are presented for treble voice and piano, and there are guitar chords too. Any profits from this edition will provide musical instruments for St Mary’s School on Tristan. The Tristan Song Project continues to take its inspiration from poems by St Mary’s pupils, which my (mainly) young composers in England turn into songs. Under Jim’s guidance, the poets have sung selections of their songs to cruise ship passengers, and here in Norfolk they’ve recently featured in a Tristan Song Project lecture-recital. Early this year, the Project received wide coverage in Music Teacher magazine, and I was pleased to receive an unsolicited enquiry from BBC radio regarding the possibility of producing a programme on the Project. Jim and I are hoping that this will come to fruition! 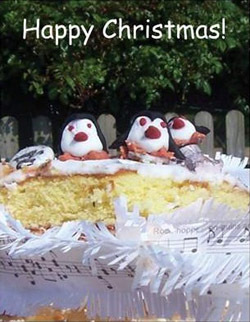 The Project songbook Rockhopper Penguins and Other Songs, published last year, currently features one additional song: From a Grateful Beak. The words are those of a thankful penguin, saved from the Oliva’s oil by the people of Tristan da Cunha. I am still supplying the songbook at £7.50 and at the moment I have a dozen copies of the special ‘Penguin Rescue’ edition with the extra song. See our separate Bookshop Section for details of how to buy the book. Photo of St Mary's School pupils enjoying the guitars provided from funds raised from the Tristan Song Project. Jim Kerr writes: 'We were delighted to receive five guitars sent from the UK and funded by sales of ‘Rockhopper Penguins and Other Songs’, a book produced in association with the Norfolk Music School. Enthusiasm for learning to play the guitar is high and when I asked classes 2 to 5 who would like to have lessons, seventeen students showed an interest! I intend to start lessons in the near future and will initially cater for 10 students each sharing one of the new guitars. For future dispatches, the school has mentioned recorders and keyboards, while another idea is to get some simple accordions called melodeons. The Project will take a big step forwards when an island edition of the songbook appears – something Jim Kerr and Dawn Repetto are working on. It will also get a major boost when the island issues a set of Song Project stamps in 2012/13, while my personal dream is for the songs to come out on CD. Islanders of any age are welcome to contribute poems to the Project, especially if they’re in regular verses. One never knows which turn of phrase will get people singing! We should like to thank Ingrid van der Merwe who, before she left Tristan in March, enjoyed taking Class 3 for some English lessons, including leading the children in the writing of poetry that could be turned into song. Her efforts were rewarded and all the pupils in the class produced entertaining poems linked to their life on Tristan. I sent the poems to Tony Triggs who runs a music school in Norfolk. Tony is keen for the Norfolk Music School to develop links with St. Mary’s School and he and his students set about writing music to accompany most of the poems. 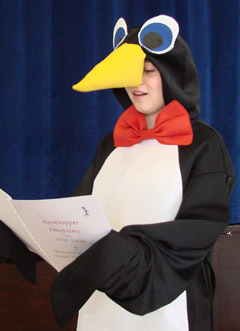 This project has been very successful, members of Class 3 are delighted with the results and we have started to learn some of the songs starting with ‘Rockhopper Penguins’, written by Kimberley Green and Tony Triggs. This project has resulted in some new friendships and some of Class 3 have started to communicate regularly with their partners in Norfolk. 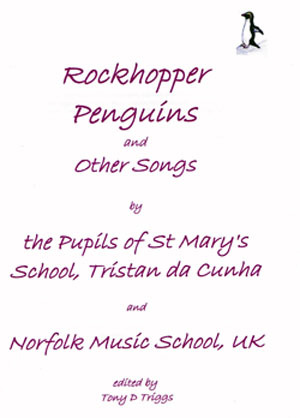 Tony has gathered the songs together in a book entitled ‘Rockhopper Penguins and Other Songs’, and Tristan pupils will be working enthusiastically on some new poems motivated by the lovely music from Norfolk.